Sweet, tangy sauce tenderizes tough, sinewy fibers. Beef ribs are at the top of the scale when it comes to flavor, but the meat tends to be slightly tough. Slow, steady cooking is best for ribs because low heat gradually breaks down and tenderizes the tough fibers, creating juicy, mouthwatering meat. To be sure beef ribs are cooked to a safe temperature, test them with a meat thermometer before serving. Ribs are ready to eat when the thermometer registers 160 degrees Fahrenheit. Barbecued ribs are a traditional American favorite, popularly cooked on the grill with or without sauce. Preheat a gas grill to medium heat. If you use a charcoal grill, heat the coals ahead of time, then push them to the edges of the grill pan. Cook the ribs slowly in the center of an oiled grate for about two hours. If you like, finish the ribs by basting them with warm sauce every few minutes during the final 20 minutes of cooking time. Use any sauce with a sweet ingredient such as molasses, brown sugar, pineapple juice or honey combined with tangy flavors such as vinegar, tomato sauce or tomato paste. Add salt and extra seasonings such as garlic salt, chipotle, cayenne or freshly ground black pepper. Serve the ribs with the remaining sauce on the side. Baking adds flavor to ribs by caramelizing and browning the meat. Pat ribs with a dry rub consisting of ingredients such as brown sugar, salt and pepper, along with seasonings like powdered onion and garlic, cayenne, mustard, cumin and paprika. 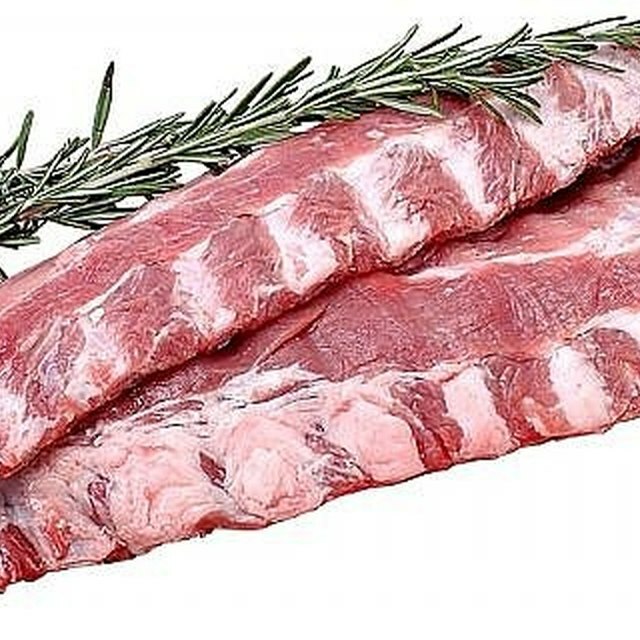 Cover the pan with plastic wrap to keep the ribs moist, then put them in the refrigerator for up to eight hours. Turn the oven on the broil setting and broil the ribs, meaty side up, for about five minutes. Reduce the heat to 300 F and bake the ribs for an additional two to three hours. Brush the ribs with your favorite bottled or homemade barbecue sauce during the last 30 minutes. Cover the pan with aluminum foil during this time to prevent scorching. Cooking ribs in the slow cooker is virtually effortless, and slow simmering guarantees the ribs soak up your favorite flavorful sauce. However, slow-cooked ribs are messy, so serve them with plenty of napkins. Arrange the ribs in the slow cooker, then pour the sauce over the top and stir so the ribs are evenly coated. Cook the ribs on low for eight to nine hours, or until the meat falls off the bone, then serve immediately. If you have time, braise ribs a day ahead to let the flavors blend and deepen. To braise ribs, season the meat generously with salt and pepper, then brown the ribs on all sides in hot oil and transfer the meat to a large, ovenproof pan or Dutch oven. Mix red or white wine with canned tomatoes, garlic cloves, beef broth or tomato juice and seasonings such as thyme, oregano, bay leaves and rosemary, then pour the mixture over the meat. 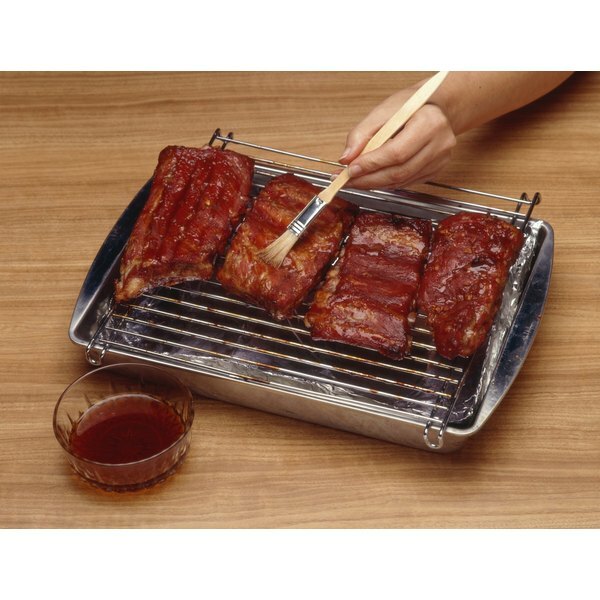 Cover the pan tightly and cook the ribs at 325 F for about three hours, turning the ribs with tongs every 30 to 40 minutes. You can also braise ribs in a covered pan on the stove top, with the heat just high enough to keep the liquid at a gentle simmer. Transfer the ribs to a serving plate. If you like, turn up the heat for a few minutes to thicken the sauce, then pour the sauce over the ribs before serving.